The cosmopolitan style of River Empress, with its rich jewel tones and vibrant atmosphere, is certain to captivate you. 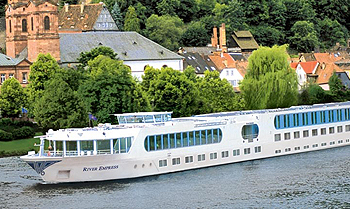 Whether you’re dining in the ship’s sleek restaurant-reminiscent of a New York jazz and supper club-or relaxing over a cup of tea on the Sun Deck as you gaze out at the 360-degree view, there is no better or more relaxing way to travel through the scenic heartland of Europe. All suites are uniquely decorated and have additional amenities and services, including daily fruit and cookie plate, elegant evening snack, robes and slippers, iPod docking station, Nespresso coffee machine, bathroom towel warmers, heated mirrors, fully stocked mini bar, bottle of wine upon arrival, in-suite morning coffee and tea service, full breakfast menu, free shoe shine and laundry service, Hermes bath products, and one-per-person in-suite well-being treatment.